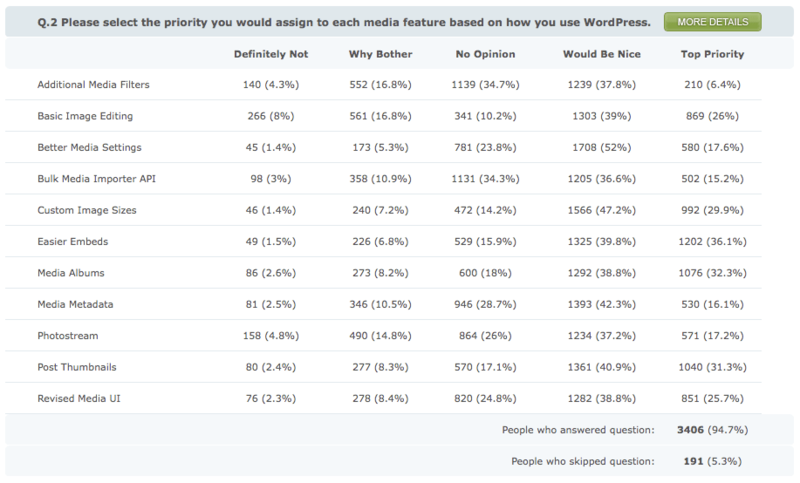 I have just noticed the nice article published on the wordpress development blog titled “2.9 Features Vote Results“. The post exemplifies a wonderful trend in the WordPress community (led by Jane Wells) having to do with connecting between the core team and the WordPress user community. The way Jane does this is by giving surveys to WordPress users, which in turn offers the WordPress core team an opportunity to understand the community needs. The table gives the full information (although I would love it if it was easily downloadable, instead of having to type in the numbers) – but its main limitation is that from a quick look, one can not easily get (let alone understand) anything. For the goal of understanding more of the results with a quick glance, I offer two simple and well-known visualizations for the results. This plot can be easily implemented in Excel (although I did it in R) and can allow us to compare the different ranking each potential feature received. For example, this shows us that most answers were usually given rank 4 (“would be nice”) for each feature. I don’t know if this can be done in Excel, but with R it is just a simple line of code. The advantage of this plot is that it allows us to compare the different features easily, while not only comparing the top rank, but also combining different rankings for easy comparison (for example, comparing how many rank 4 or 5 each feature received). So for example, the plot shows me that the most ranked with number 5 was the feature “easier embeds” but the most ranked “number 4 or 5” was the feature “custom image sizes”. The feature “media album” came close to these two, but didn’t top either. It would be nice (if possible) to publish the full data of the surveys, not just the results. The second question of the survey gives different answer than the first question. But since the difference in percentage seems to be so small compared to the other options, I would guess that all of the top 4 features are more or less in the same level of interest to the community. p.s. to Jane – why do none of the numbers in this table add up to 3406 (the number of respondants) ? p.p.s. to Jane and the Dev team – great work people! Previous Previous post: What is R?